The cold air necessary for your work zone makes your employees cold - but that’s only because the body loses heat in more than one way. If you are prepared to combat heat loss, you can keep your employees warm in almost any environment. There are five way the body loses heat, all of which can impact your comfort and health on a cold day or even in an artificially cold environment, like a freezer or walk-in refrigerator. Any of the five ways can cause the body to lose heat, but if one of them is more prevalent than another, then you can lose heat faster. For example, an employee doing physical activity, like stacking, needs different protection than an employee facing wind chill from driving a forklift. The latter situation represents an increase in convection heat loss with no added body heat from physical movement. Cold doesn’t just cause discomfort – it can seriously impact the productivity of your workforce. Job performance is affected in a number of ways. Employees’ ability to concentrate and remain alert is decreased – this brings about decreases in efficiency and productivity. Exposure to cold means a loss of coordination and a loss of dexterity, further impacting productivity. If your employees are not protected, their focus will be on staying warm, rather than the tasks at hand. A drop in alertness and comfort can also mean an increase in safety hazards. When not adequately protected from the cold, the body shivers to generate heat. Shivering causes unsteady hands – hands that are responsible for carrying out complex and important tasks. In addition, a study from the NIH showed that reaction time is slower during exposure to cold temperatures and this effect is still evident 60 minutes after removal from the cold. 1 For those operating machinery, a drop in reaction time – coupled with loss of coordination, dexterity, and alertness – could mean an accident that involves not only product loss, but injuries that keep your employees out of the workforce for an extended time. Protecting your employees from the cold in your work environment isn’t just vital to their comfort – it is vital to your bottom line. Each form of heat loss can be combated with the right protective equipment. The easiest forms of heat loss to battle are convection and radiation. 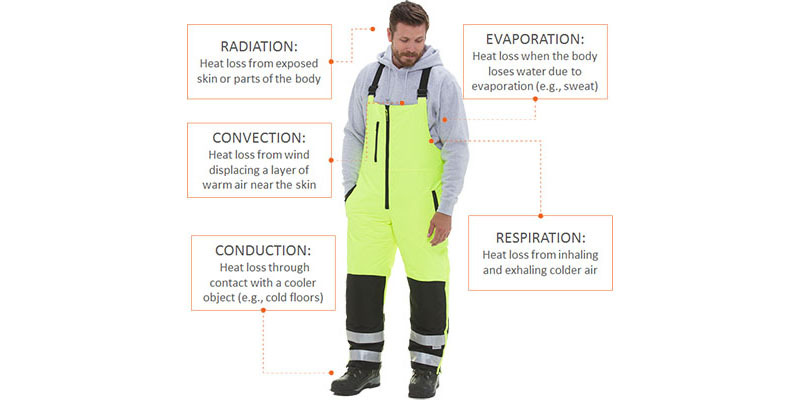 Jackets, pants, overalls, and other clothing designed for cold environments protect against heat loss due to convection. It is important to bear in mind activity level when choosing these garments – as stated above, a person that is moving their entire body or exerting themselves more will generate more heat and not need as warm a jacket as someone only moving their hands and arms to drive a forklift. Hats, gloves, scarves and other accessories fight heat loss through radiation by covering skin not protected by jackets and pants. Heat loss via conduction is often overlooked, but combating it is vital to remaining warm, especially in work environments where everything from the products to the floor and the walls are cold. Choose footwear with outersoles built for cold temperatures; the outersole should fight conduction and prevent break down due to temperature. Boots should also offer insulation, moisture wicking and ankle protection to further combat the cold. When choosing gloves, select a pair that will handle the temperature and also provide some wrist protection if it is really cold. Insulated gloves are common with performance or leather gloves, and you can also supplement with a liner in extreme temperatures. To fight heat loss via evaporation and respiration, make sure your employees stay well hydrated while working, especially in positions with frequent movement that may cause sweating. Keeping the core warm with base layers and jackets helps keep the lungs warm, but in extremely cold environments, help reduce the amount of cold air they breathe in with a face mask, gaiter or balaclava that covers the nose and mouth. To protect your employees properly, examine your work environment and the specific job duties of each position. For those on their feet on a freezer floor, make sure their footwear resists cold transfer. For those operating machinery that creates wind-chills, factor in the further drop in temperature. The better protected your employees are from the cold, the less time they will spend dwelling on getting warm, and the more they can concentrate on the tasks at hand.